Sexual Dimorphism: No apparent dimorphism in body length exists between sexes. Adult males are typically heavier. Other Features: Smallest crocodile species, typically much smaller than the maximum length of c. 2 m (6.6 ft). Both sexes may become quite bulky and wide. Proportionally more than doubles its weight for each 30 cm (1 ft) of growth in length between 91-182.9 cm (3-6 ft). Western & Central Africa, as far south as northern Angola and ranging to just east of the Congo River. Northernmost populations are found in southern Guinea-Bissau east to near Yobe, Nigeria. Small rivers and pools in forests and swampy regions. They require dense rotting vegetation to construct nests. Approximate number is unknown; abundant numbers in parts of Ivory Coast, Ghana, Gabon, Congo & Cameroon. Hunting and habitat loss is a threat in some areas. Activity Cycle: Nocturnal, hunting for prey at night and resting in the water during daylight hours. Locomotion: Considered one of the most terrestrial of crocodiles, commonly venturing on land. Can "high walk," as is common with crocodiles. When swimming, will propel with the limbs (paraxial), tail (axial), and can use both simultaneously, producing a hybrid motion. Also uses the tail to propel the body vertically out of the water to ambush prey on overhanging tree branches. Diet: Opportunistic predator with a varied diet, including millipedes, beetle larvae, fish, crabs, shrimp, reptiles, amphibians, birds and small mammals. Plant debris and rocks (gastroliths) are often found in the stomach. Interspecies Interactions: Has a large degree of diet and habitat overlap with the Nile Monitor, which also preys on dwarf crocodile eggs and juveniles. Courtship: Males produce drumming vocalization, often throughout the night, and partners will rub one another’s head and jaw. Nesting: Mothers build mound nests of fallen leaves and rotting vegetation about 17 meters from the water and 1-2 meters above the water line. They guard and visit their nests. Clutch Size: Mean of 10-14 eggs, 6 - 17 observed. Longevity: Commonly survive >40 years. Smallest crocodile species, typically reaching a maximum total combined body and tail length of c. 170-180 cm (5.6-5.9 ft). Competes with other crocodiles but minimizes direct resource competition through habitat partitioning. Eight West African dwarf crocodiles hatched in November, 2017 at San Diego Zoo's reptile house, a first in the zoo's history. © 2015-2018 San Diego Zoo Global. Updated August 2015. How to cite: Dwarf Crocodile (Osteolaemus tetraspis) Fact Sheet. c2015. San Diego (CA): San Diego Zoo Global; [accessed YYYY Mmm dd]. 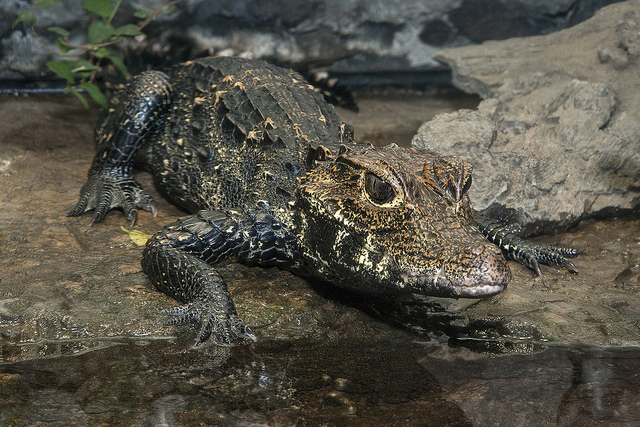 http://ielc.libguides.com/sdzg/factsheets/ dwarf_crocodile. Many thanks to Dr. Mitchell Eaton for providing expert content review of this fact sheet. Dr. Eaton has conducted extensive research on African Dwarf Crocodiles in the wild, and his studies have greatly advanced understanding of the ecology, population dynamics, and spatial genetic structure of this species. Dr. Eaton is currently a Research Ecologist with USGS and serves as an adjunct faculty member in the Applied Ecology Department at North Carolina State University. His research focuses on applied wildlife ecology with emphases on decision analytic techniques and the use of quantitative methods for ecological inference. Dwarf crocodiles are the smallest crocodile species. What adaptations do you notice while observing this one swimming at Africa Rocks, San Diego Zoo? © San Diego Zoo Global. All rights reserved.